Twice today, prayers for others were answered, or at least I found out these were answered. One is humbled in the knowledge that God stoops to hear our prayers, especially for others. The key to having God listen is threefold: having faith, persistence, and the acceptance of suffering. If one is praying without determination and faith, one insults God. If one prays in suffering, joined to the Cross, one is not praying to God but with God. That is the key to answered prayer-praying in the Divine Will. Most of the time people pray too quickly, and without what I would call intercessory pain. Christ invites us to join Him in suffering, a topic I have covered on this blog many times in the perfection series and in posts on suffering. When God allows us to suffer, He is inviting us to enter into the mystery both of our own purification and the reparation of sins and failings. See the reparation series a few weeks ago. However, prayers are tainted by our egos which means that pure prayer can only come from complete objectivity and renunciation of our own wills. When we pray in Divine Providence, prayers are answered. But, this means dying to self. Giving up our own ideas on how prayers should be answered is a beginning, a moving towards humility. Pray with humility and openness, in suffering. If anyone thinks this pope is the anti-Christ or an anti-Pope, that person is a heretic. If anyone thinks God, the Three Persons in the Blessed Trinity, will abandon the Church, that person is a heretic. If anyone thinks this pope is not the true pope, that person is a heretic. If anyone thinks we are not heading for really hard times, that person is just plain not paying attention. This is a real warning. I am reading the title of the book put in the heading of this post. The book, by Father Stefano M.Manelli, F.I., reviews that saints' writings on the Eucharist, the Mass, and Adoration. The book dovetails my new perfection series on the Incarnation and the Indwelling of the Trinity. I am borrowing this book from a friend, but it is online here. The online version is older and the one I am reading in book form is revised slightly. Let me share some bits which overlap with the discussion on perfection. First of all, I want to highlight the insights of St. Gemma Galgani, a favorite of mine, who I have quoted in the long perfection series. To the Eucharist, then, we should go. To Jesus we should turn — to Jesus, Who wishes to make Himself ours in order to make us His by rendering us “godlike”. “Jesus, Food of strong souls,” St. Gemma Galgani used to say, “strengthen me, purify me, make me godlike.” Let us receive the Eucharist with a pure and ardent heart. This is as the Saints have done. It should never be too much trouble for us to grow familiar with this unspeakable mystery. 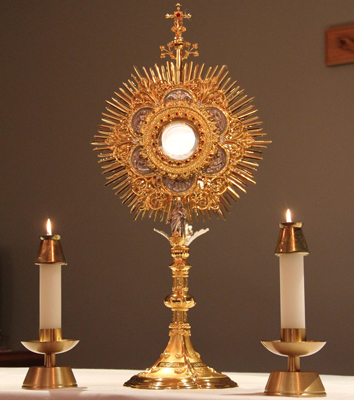 Meditation, study and reflection on the Eucharist should have an important place each day on our timetable. It will be the time of our day richest in blessings. How daring of Gemma to tell us that we shall become godlike in receiving and adoring the Eucharist. St. Bernard tells us the same thing, that we become like God, as we were intended to be before the Fall. Holy Communion represents the loftiest point of this exercise of love, Whose consuming flames unite the heart of a creature and Jesus. St. Gemma Galgani could exclaim in this regard, “I can no longer avoid the thought that in the wonderful scope of His Love, Jesus makes Himself perceptible and shows Himself to His lowliest creature in all the splendors of His Heart.” And what may we say about the “exercises” of the heart of St. Gemma, who desired to be a “tent of love” in which she would keep Jesus always with her? She longed to have a “little place in the ciborium” to be able to stay always with Jesus. She asked that she could become “a flaming ball afire with love” for Jesus. Daily or even weekly Adortation can heal and even deliver souls from evil. Receiving Holy Communion should not merely be a weekly exercise without reflection, but a uniting of the soul with the Crucified Savior. Second, God is among us daily. Do we realize this? He dwells "in our midst" and within us if we remain in sanctifying grace. Third, the Mass sustains the world, which would have been destroyed by sin if God's Sacrifice was not daily offered at the altar. Most Catholics forget or do not know that the Mass is the Sacrifice at Calvary, occurring over and over and over daily, in most places in the world. Fourth, for most of us, unless we live miles away from a daily Mass as I did in Upper State NY, the Mass is overlooked as something worthy of making an effort to attend. Let us be generous and willingly make sacrifices so as not to lose so great a good. I have been reading Breitbart for years. Highly recommend this news site. Police in England finally use word "terrorist". Now, they need to add a few descriptive adjectives. A Metropolitan Police spokesman said the men were being held on suspicion of ‘being concerned in the commission, preparation or instigation of acts of terrorism’.